So why Build integration? Well having your unit tests integrated in your automated build flow is a must have for every web developer. The time that we manually build and unit test our code is over. If you are still doing that, then that's a big sign for you to critically look at your workflow. You are literally living in the past! Most of you developers know how to unit test your .NET code. Microsoft got great tools in Visual Studio and TFS/VSTS(VSO) to automatically run your unit tests and flag the build as a failure if one of your tests fail. This will result in finding issues earlier in the development process and thus probably better quality and faster development. The second extension is a context menu extension that allows you to run your tests within two mouse clicks. This plugin also provides you additional functionality such as code coverage results, using blanket.js. It produces really nice code coverage files that exactly pinpoint the code that hasn't been hit. It will be easy to get your unit tests to run on TFS/VSTS, once your unit tests run within Visual Studio. First crab the NuGet package. The NuGet package, as stated earlier, has the necessary files to run your unit tests, this also applies to TFS/VSTS. 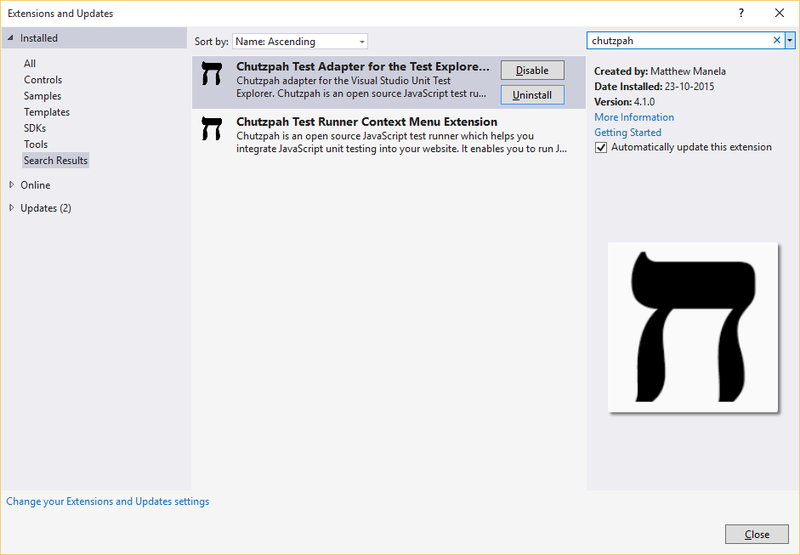 Secondly add a Visual Studio test build step to your build flow. 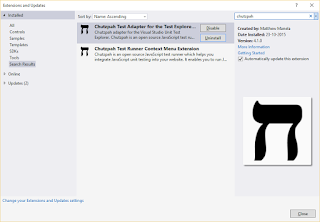 Lastly make sure that you point to the Chutzpah test adapter. This actually points to the NuGet package that you've installed for your project. Make sure that the $(Build.SourcesDirectory) has the packages folder or you might up ending with strange errors. Well and that's it. Hopefully you've had enough information. If you have any questions or problems feel free to contact me.